Vacuum Furnace Systems Vacuum Furnace Heat Treating Automation DHVEVacuum Systems is a vacuum furnace manufacturer offering a unique product line up focused on automated vacuum furnace systems with capabilities in heat treating, vacuum carburizing oil or high pressure gas quenching and nitriding. 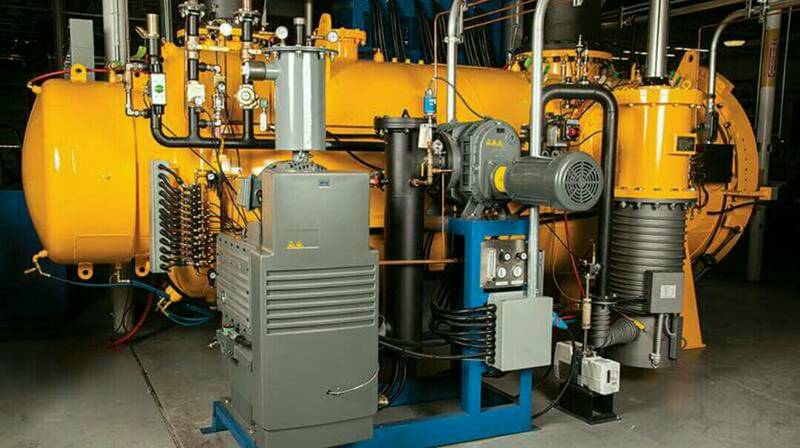 Technology for the base ModulTherm® systems marries multiple vacuum furnace chambers (treatment chambers) to a common quench (oil or high pressure gas). The SyncroTherm systems integrate multiple small batch hot zones to a common high pressure gas quench chamber. Both can be integrated for totally automated operation using our material handling expertise and support furnace expertise (temper, pre-oxidation, washer). The combinations result in a flexible and automated vacuum based heat-treating systems designed to produce the highest quality, and highest quantity output. Both ModulTherm and SyncroTherm were originally focused on Low Pressure Vacuum Carburizing and are now globally established with proven excellence in this field. Acetylene based LPC was perfected along with 20 bar pressure helium (and/or nitrogen) gas quenching (HPGQ). Many hundreds of these treatment chambers are in operation around the world. Many other markets have found them to be quite excellent and have embraced their respective capabilities in annealing, austenitizing, hardening, brazing and more. The extended ModulTherm product line also offers larger load sizes. These capabilities enables the heat treater of larger loads or larger parts to enter into fully automated processing. Modular system upgrading for more capability and capacity is precisely the concept behind the ModulTherm®. For some full automation is a lofty goal, we realize it doesn’t fit everyone’s production rates. This is where the DualTherm® comes in. It enables the lower volume heat treater to benefit from LPC and HPGQ without the need for a total system. It further provides the advantages of “cold chamber quenching” and can thereby provide results equal to the ModulTherm® system. DualTherm is also available with oil quenching in lieu of high pressure gas quenching. Also included in our line up is the NitroTherm® nitriding furnace. This Vacuum Purged Gas Nitrider (VPGN) brings greater efficiency and speed to the nitriding market and eliminates the pungent odor of ammonia from the factory floor.